Ready Decks® was originally conceptualized in 1998 by Bradley W. Johns. Having started a company in 1997 called Vinyl Visions Inc., selling and installing custom vinyl decks and fences, Bradley quickly realized the need for not only great quality at an affordable price, but that his customers wanted to purchase a deck easily and have it built quickly. He also found that most homeowners get nervous and worried that they are going getting ripped off or that their daily life will be disrupted for days or even weeks. So, after three years of research and development, Ready Decks® was officially available. For the first time, customers could find affordable decks that met their needs! Even better, they could relax and even go to work, because they knew exactly what the deck would look like and how much the total cost would be! This was just the beginning. Bradley knew that, although he was providing good people with a great product and service, he could do better. The next two years, he, along with much ingenuity input from his father, David W. Johns, critiqued and analyzed everything about what Ready Decks® was doing. From literally every footstep taken, to lumber waste, to engineering, to accounting, they worked day and night to bring prices down while increasing the quality and professionalism of service. In 2003, Bradley was building at least one deck each day, and was feeling great about his success and found even greater satisfaction in making his customers dreams become a reality. Often, he would be told, “I never thought that I could afford a nice deck like this!” This prompted him to then begin a quest to expand and provide more people his, apparently, much needed wood deck installation service. 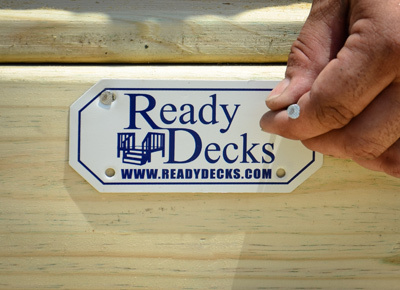 In 2004, Ready Decks® was expanded to cover all of North Louisiana, East Texas, and Southern Arkansas. To control quality and continue the superior service, Bradley Johns teamed with John Owens to create Ready Decks® Franchise Systems. This made available the opportunity for someone to own and operate an innovative Ready Decks® location. Today, Ready Decks® has multiple locations covering four states, and the only thing that has changed is that we offer more options and products at the same low dependable price. Contact a Ready Decks® deck installer today to discover what we can do for you.